Vmix can be used in large scale multi-camera events or simple webcam one person productions. There is a once off payment to use vMix so you don’t need to pay a yearly subscription fee. Once you pay for vMix you also get free Version upgrades for 12 months! After the 12 months you can pay a small upgrade fee to have the latest and greatest version of vMix. One of the greatest advantages to vMix is that has no proprietary hardware and can run on almost any Windows based computer. You can use vMix as a presentation software in a classroom setting or build your own video workstation and display multiple cameras, titles and videos for a large event. From start to finish vMix is the most powerful software mixer that is available. We offer turnkey systems to customers that want a powerful grab n’ go video system. Starting at $10,995 These systems offer 8 HD-SDI inputs, multiple outputs, full vMix software, in one complete and incredibly powerful briefcase system. More information about these plug and play systems are below along with more information about the vMix software. Media Up to 1000 multi-source inputs including video/audio files, PowerPoint (Microsoft Office Req. ), DVD, graphics, streams, desktop apps, titles, live social media. Network sources limited only by bandwidth. No artificial DDR players, all imported clips are live and ready to play. Transitions Cut, Fade, Zoom, Wipe, Slide, Fly, CrossZoom, FlyRotate, Cube, CubeZoom, VerticalWipe, VirtualSlide, Merge and two custom Stinger channels. Mix/Effects Each input includes 5 “Multi View” overlay channels to create complex Mix/Effects. Add logo bugs, lower thirds, titles, text in combinations to create compelling productions. Downstream Keyers 4 DSKs / overlays with individual transitions, alpha channel and custom scaling/positioning. Image Adjustment Color Correct, Deinterlace, Sharpen, Zoom, Rotate, Pan and Crop any input in real time. All effects are processed in 4:4:4 32bit color space for optimal video quality. Audio Mixer Independent control and monitoring of all audio sources with Mute, Solo, Follow (Auto Mixing), Delay, EQ, Compressor and Gain. Instant Replay Full four camera instant replay system built in with continues recording and playback. Controllers Includes standard keyboard and mouse control with configurable shortcuts/macros. Optional vMix Control Surface available. Built in Web Controller can be used to control vMix from any web connected device on the local network. MIDI supported. Recording AVI, MP4, MPEG-2, MOV and MXF for both Program and ISO recordings with a variety of compression formats available. 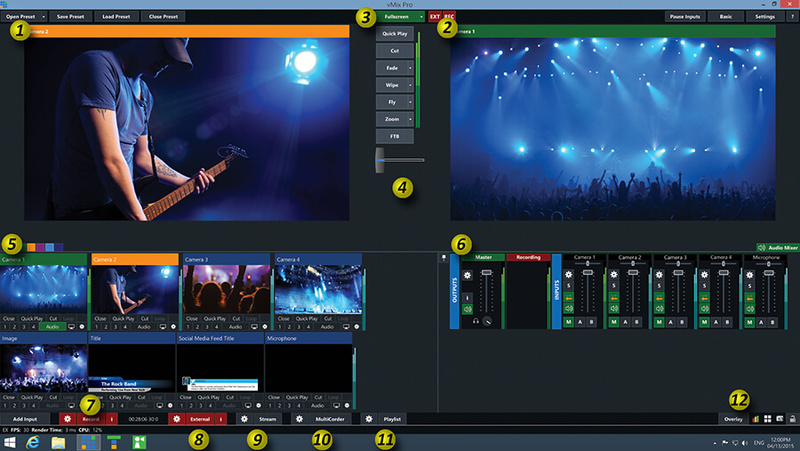 Multiview Live multiviewer output to secondary display or HD-SDI with configurable layouts and titles, audio meters and tally display. Video Formats 2160P (4K), 1080P, 1080i, 720p and SD Multi Format capable. 23.98, 24, 25, 29.97, 30, 50, 59.94, 60 frame rates supported.